Congratulation to Chris Davies. Last Saturday while fishing as a co-angler at Lake Lanier in the FLW Bulldog Division BFL Chris landed a five-bass limit weighing 14 pounds, fifteen ounces and placed second out of 153 anglers. For second place, he won $1253. He also had big fish on the co-angler side with a six pound one ounce fish which added $382 to his total winnings of $1635. 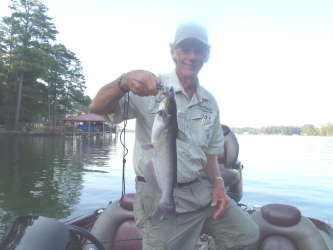 Chris has been in local clubs for many years and fishes other tournament trails, too. Two other Georgia anglers did very good in tournaments, too, while fishing the FLW Tour Series at Tavis Lake in Texas. The FLW Tour is the top trail in FLW and anglers can get in by invitation only, after qualifying through other trails like the BFLs. Clayton Batts from Macon had 20 keeper bass weighing 48 pounds, one ounce in this four-day tournament. He won $17,000 for 7th place. In 8th place Troy Morrow of Eastanollee won $16,000 by catching 20 bass weighing 47 pounds, nine ounces. In this tournament, 164 boaters and 164 co-anglers started the first day. After two days the top 20 boaters fish a third day and the rest go home, but anglers in 21st through 54th place do get money, with 21st getting $10,000 and 54th winning $4000. After a third day, the top ten fish for a fourth day and 11th through 20th go home, but with winnings of $10,000 each. The final ten are the best of the best in that tournament and first place paid $100,000 plus a $25,000 bonus for fishing out of a Ranger boat. Tenth place pays $14,000. Mark Rose, a pro angler from Arkansas, fishes out of a Ranger and has won the last two FLW Tour tournaments, for winnings of $250,000. So there is a lot of money in tournaments for top anglers. The co-anglers fish only the first two days and the winner got $20,000 down to 54th place winning $700. Co-anglers fish from the back of the boat and have no say about where or how to fish, so they are at the mercy of the boater. Some boaters try to help their co-anglers, others don’t treat them so well. And of course, the entry fee is quite different between boater and co-angler. On a local, much less expensive level the Potato Creek Bassmasters fished our February tournament at West Point lake last Saturday. Niles Murray won with five fish weighing a little over ten pounds, and had big fish with a largemouth weighing more than six pounds. Dan Riddle was second with five weighing 9.04 pounds and my five weighing 9.03 pounds was third. Third place paid me $84! I think Raymond English placed fourth with eight pounds. We had a warm but rainy day. The water temperature had dropped from 62 on Tuesday to 58 Saturday morning and with the clouds it did not warm during the day like we hoped it would. There was a Highland Marina Team Trail tournament that day. I do not know how many boats were in it but they took off 30 minutes before we did and the first four places I wanted to fish had at least two boats on them when I got there. The fifth place was back in a big creek and there was only one boat there, fishing the right bank, the best one due to water depth. So I started on the left bank since I had already ridden around more than I wanted to. After a few minutes, I caught a small keeper spotted bass on a rattle bait but that was it in that creek. I fished several more places, usually with other boats in sight, until noon without another bite. I was very frustrated. Fishing was supposed to be good! At noon I ran into Whitewater Creek headed to a point that was on a Map of the Month article last March. My luck did not change, I could see another boat on it long before I got there, so I stopped on a point that I had never fished. My first cast to that point produced a 2.5 pound largemouth. An hour later I caught my eight bass off that point, a 2.5 pound spot. The other two keepers there were just keeper spots and the other four were short largemouth and spots. I fished there until 2:00 without getting any more bites, then hit three more places before our weigh-in, again with no bites. It was amazing how quiet the lake got after 2:00 since that is when the Highland tournament weighed in. The boats just disappeared. I heard it took five bass weighing 20 pounds to win that tournament. For many years if I headed to a place I wanted to fish and a boat was already there I let it upset me. I would worry way too much about it and not be able to concentrate on catching bass. But one year at Eufaula, in a two-day tournament, on the second day I headed to a bank where I had caught several bass the first day. When I got close I saw another fisherman had beat me to it. So I just went to the opposite bank in disgust and started fishing. I caught three nice keepers before getting to where the creek narrowed down and I was near the guy fishing where I had wanted to start. He told me he had not had a bite! That taught me to ignore others and just fish, although sometimes it is hard to do! This entry was posted in Bass Fishing, Tournament Fishing on February 28, 2017 by ronniegarrison.